Vinyl fences require any protective paints or stain to keep it looking good. Some older vinyl fence products had issues with wear and tear because the product was recycled vinyl. Virgin vinyl is now the standard used in most new vinyl fence manufacturing so the vinyl is known to withstand UV rays as well as the harsh weather often seen in Calgary. 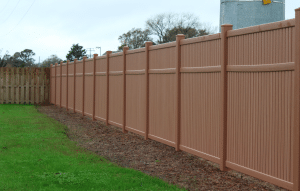 Vinyl fence is more costly than cedar or pressure treated fence but many of our customers think its worth it due to the savings in paint and stain costs and the labor to apply the paint or stain. Vinyl fence comes in a variety of colors including Tan, Black, White, Woodgrain Grey, Woodgrain cedar and Woodgrain Mahogany. Unlike wood fences, vinyl fences posts are installed by installing a vinyl sleeve over steel posts. The posts are as sturdy as wood and will not warp like wood can often do. There are many options when it comes to vinyl fence including lattice, picket, man gates, standard gates, decorative posts, etc, etc. If you love the look of natural wood you likely won’t be interested in vinyl fences but if you are a fan of low maintenance then vinyl fences might be a great choice for your next landscaping project. Call us for a free estimate at 403-452-8552.